Joe Lopez' watercolors capture a unique place in time where a border "barrio" culture embraced the history and traditions of two countries. 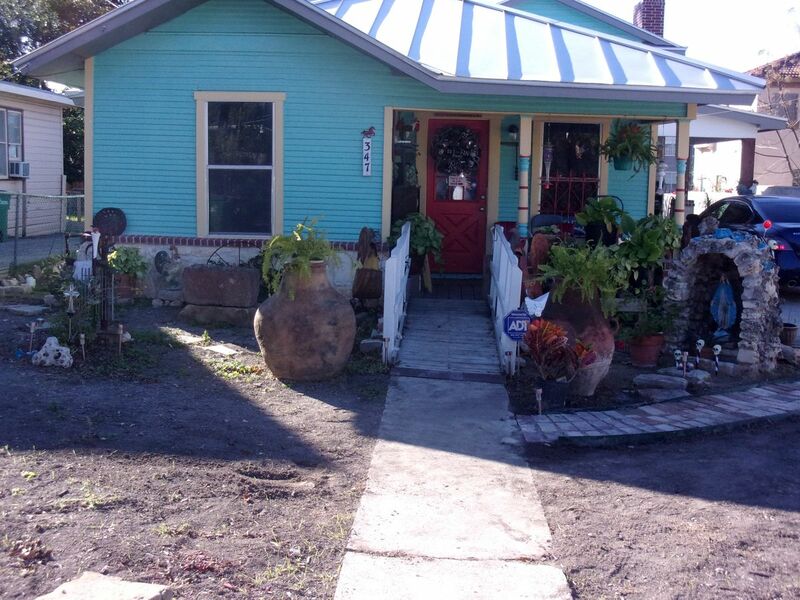 Lopez spent his early life in a South Texas barrio hidden near the posh neighborhood of Alamo Heights in San Antonio, Texas. Most locals are unaware that such a place existed near an area where wealth was plentiful. "El Barrio Escondido" (The Hidden Barrio) created a vivid cultural backdrop of family ties, religion and social influences that are evident in Lopez' work. Lopez has become a significant leader of the Chicano Art Movement, known nationally as an artist who paints real life, and as a man who stands up for his family, his culture, and his rights, even in the greatest adversity. He has persevered throughout his life, first to be "normal" even though he was born with only one hand; to learn the skills of an artist with virtually no resources for art school or lessons; to open his own studio and art gallery where he shows the work of "undiscovered" artists as well as his own work; and to fight and win a legal battle against a major U.S. company that not only attacked the title of one of his best-known paintings, but the very culture he strives to portray in his artwork. Lopez' introduction to art came from his Uncle Basilio, a part-time artist who made wooden folk art carvings. A student at St. Anthony Shrine School, Joe's talent was first noticed by a nun who arranged a small scholarship at the local Witte Museum Art School. He studied art in high school and attended the La Villita School of Art and the San Antonio School of Art while working as a part-time gardener for a wealthy couple who helped him acquire a scholarship to attend several sessions at the prestigious McNay in San Antonio. Lopez gained business and artistic experience as a stock boy at Scrivner's Inc. department store, in the advertising art department of Dillard's stores and Centeno's Supermarket, and in the graphics department at Fort Sam Houston where he worked for 22 years until his retirement in 2007. Lopez later trained under the nationally recognized watercolor artist Warren Hunter, and other well-known Texas artists, such as John Squire Adams, Finis Collins and Jesus "Chista" Cantu. Nationally acclaimed artist Jesse Trevino was an inspiration to Lopez because of his ability to paint with one hand. Joe Lopez paints people he can identify with: people who have struggled through life. Street vendors and common laborers are a strong theme in his paintings. As a young boy Lopez sold newspapers, his cousins worked as shoe shine boys and his uncle sold ice cream in the neighborhood after work. Lopez' paintings show the beautiful dignity and pride of "los vendedores" who sell street dolls, nopalitos, fruit, cascarones, knowing that it will bring money that will help support their families. The artist's signature works are found in his Gallo Series. The gallo (rooster) has long been a symbol of strength with a "stand and fight" attitude in Mexican culture. 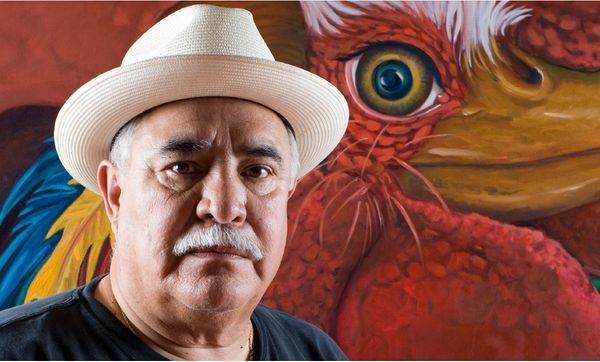 Lopez, fascinated with its symbolism and the regal look of the rooster, created a painting entitled "Puro Gallo" (a popular slang term meaning "pure blood") which eventually led to a lawsuit being filed against him by the Ernest and Julio Gallo Winery over the use of the Spanish word gallo. Thousands of people supported and rallied to his cause, and was represented by attorney Filemon Vela from Corpus Christi. The suit was settled, and Lopez has the right to use the word gallo in his business. A true victory for the man who was willing to "stand and fight." As Lopez states, "We didn't tuck our tail and run, a true gallo doesn't do that...estos gallos no corren." "I always say, I took the scenic route." It has been a long and adventurous journey with many interesting stops along the way. In addition to the events and exhibits in his own gallery, Joe Lopez' work has been displayed in numerous art museums and cultural centers including: The McNay in San Antonio, Southwest Museum of Art and the Martinez Center in Corpus Christi; Laguna Gloria Art Museum in Austin; Narzizo Martinez Cultural Center in San Benito, Texas; and the Texas A & M University Memorial Student Center. He designed the official poster for Pope John Paul II's visit to San Antonio, and his artwork has appeared on posters for the San Fernando Cathedral's 250th Anniversary Celebration, and La Feria de San Fernando. His painting "Taquachito Night" is the cover art of a CD produced by the Smithsonian Folkways Institute, entitled "Taquachito Nights." His story has been told on National Public Radio (NPR), KWEX TV, CNBC (in Spanish), Hispanic Magazine, the Houston Chronicle's "Texas Magazine," San Antonio Express News, La Prensa in Toledo and San Antonio, and more. Lopez' paintings portray a sturdy confidence forged in the triumphs and tragedies of a barrio childhood. Joe Lopez is a mentor and advocate for children from the barrio. In May 2000, he completed an 11ft x 50ft outdoor mural commissioned by the Roosevelt Park Neighborhood Association in San Antonio, working with student apprentices from the nearby "Second Chance High School" at Blessed Sacrament Academy. The colorful mural scene, "El Barrio On My Mind," can be found on the side of a local convenience store in the historic "Mission District" of the city.